Today we will be stretching everyone’s Western developed brains to consider practices of organization. We are very tied to science in our systems of organization. We use Latin names and speak of groups, families, etc. I will be using some ideas from the book Stuffed Animals and Pickled Heads. I am not an expert in museum studies, however one of my best friends is well versed in this area. We have always followed each other’s studies have regular critical discussions often. She loaned me the SAPH text in 2006 and my thoughts have been more abstract ever since. Slicing through the first layer of the book is the organization of subjects as viewed through different societies. We may think that eagles are related to hawks, which are related to falcons, which are related to smaller predatory birds. The Native Americans believed that eagles were related to the sky, which was related to the mountain top, which was related to snow. Who was right? Most westerners say that we use a scientific taxonomic system so ours is the right way. But can you negate the system that the Natives used? Not logically. Science, which is very useful and tied heavily into post enlightened thought, can only support theories proposed to its system. It cannot disprove organizational matters that do not operate in such a way. We have been seeing growth in non-scientific systems in the last century or two through curation. We have seen paintings organized to share specific thoughts and concerns. Museums have been trying various methods over time. We used to use the Wunderkunst idea of display including scenic objects similar to the Native Americans similar to a window in time. We now have curated exhibitions that display 19th Century metal work including opulent vessels displayed with slave shackles. 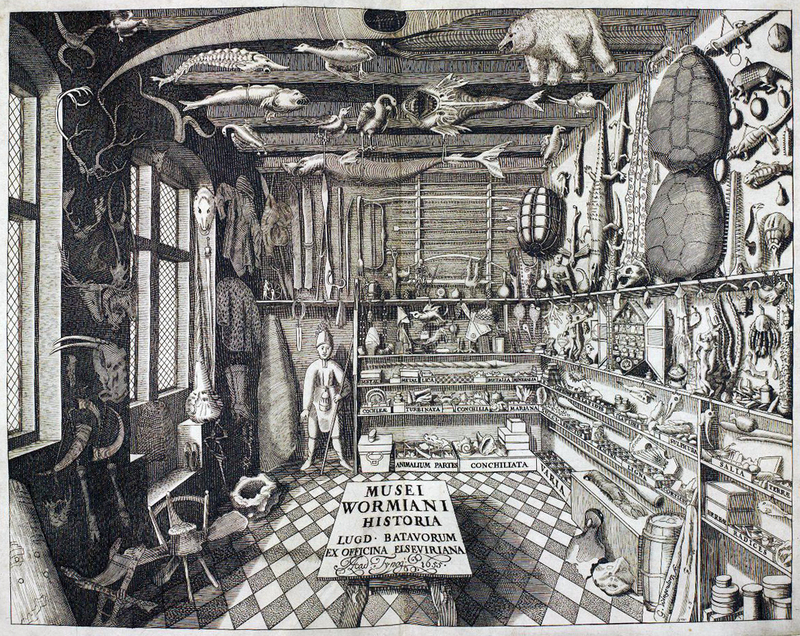 To fully grasp the idea of organization, we must look back to wunderkunst, wunderkumen, oddities, and cabinets of curiosities. SAPH does well in this area. Royalty loved to collect tokens to remind them of their travels or conquers and display them in their court for others to be impressed by. With science being new, kings, czars and collectors developed their own systems for display. Many small street side museums in Europe still organize in this way. America has it’s share of small private museums as well as oddities like Ripley’s Believe it or Not! So, can the academic world live with various competing ideologies of organization? Maybe the answer lies in “heritage.” I think that there is a progression of density that is present in all museums. Everything rises to it’s own level. I believe that originally, the original culture dictates the method and content of a display. During time, others may try to adjust this system in the name of modernity, science, even religion. Each factor changes the focus of the display until it finally comes to rest at it’s final level. This happens because any museum can only generate so much income based on what it is they have to display. Here is the point where I get bold and go on a limb: I think that those museums that rise to the top do become tainted from the original design of an object or culture. The more enterprising the museum, the less the display relates to it’s original culture. I will provide two extreme examples for consideration: The Britany Spears Museum (regaling in all of it’s brown paneling and stained ceiling tiles) and the International Village at the Illinois’ State Fair. Consider what each of these places attempt to provide. Consider the budget of the pop star’s hometown museum with that of the Illinois state fair. Finally consider the truth that each provide about their intended subject. Comments are welcome.